Thailand is now one of the top tourist destinations in world. So what’s the best way for travelers to get their mobile communications up an running quickly? Here are a few things to consider when getting a local Thai phone number. Before you trip to Thailand, the most important thing you can do is find out if your phone is locked or unlocked. If you don’t know the status of your phone, one big tell is if you paid $, $99 or $199 for a top model Apple, Samsung or Nokia phone. A price that low means your phone has been subsidized, and you are likely in a 1-3 year contract where your carriers are trying to make their money back (and more) over the length of the contract. If your phone is locked, you won’t be able to use a Thai SIM card in your phone. If you paid $500 and up for your smartphone, your phone is unlocked and you’ll be fine. More about unlocking your phone. One option is to buy a cheap unlocked phone before you come. The other option is a pocket wifi or mifi device. This gives your smartphone an internet connection to use all features except voice and SMS. There are now many options to rent this device in the airport. You can buy a Thai SIM card online before you come on places like Amazon or EBAY or HERE – if you have planned ahead. Keep in mind Thai SIMs now require registration, and unless the SIM is pre-registered, you may need to do that after you land at the phone shop. All Thailand phone networks use SIM cards. Does your phone? Check if your phone uses a SIM card or not. If not, you won’t be able to get a local Thai number. You may, however be able to use roaming if your network has a roaming agreement. International Roaming means you use your home number and roaming usually must turned on before you leave your home country. Call the call center and ask them to turn International Roaming on, and also ask about their charges for data and voice roaming in Thailand, as well their preferred partner network. Data roaming can be as cheap as $10 a day, on the right network. In other cases roaming charges can be grossly expensive. Even when it’s a reasonable charge, the prices in Thailand are among the cheapest in the world, so likely still want a local SIM to take advantage. The first thing you’ll want to do is get connected. When you switch on your phone you’ll either be given the option to connect to one of 3 main networks in Thailand: AIS, DTAC or True. When you connect locally, keep in mind you will be on roaming. This means you’re paying roaming prices, which can quickly add up. Even without a phone call you may also be on data roaming as your smartphone’s data may start in the background. For Fun: check Instagram’s latest BKK airport photos. 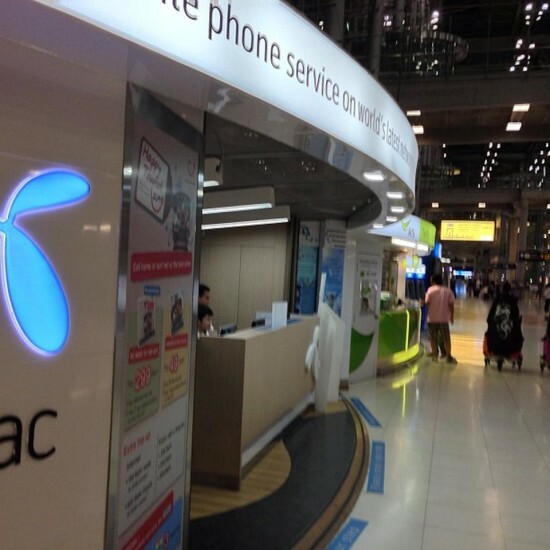 In Suvarnabhumi Airport (BKK), there are several places to buy a Thai SIM card. The main spot are the Network’s kiosks after you exit customs, right outside of the International gates where people hold up signs. 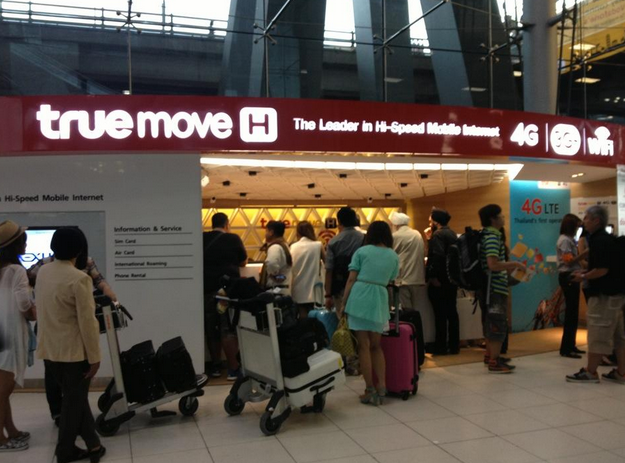 There are kiosks for Thailand’s main mobile operators – DTAC (blue), AIS (Green ) and True Move (Red). If there is no line, anyone of these is fine. Jump in line and wait your turn, and the staff should get you hooked right up. Tip: Remember you’ll need to store your home SIM somewhere safe. 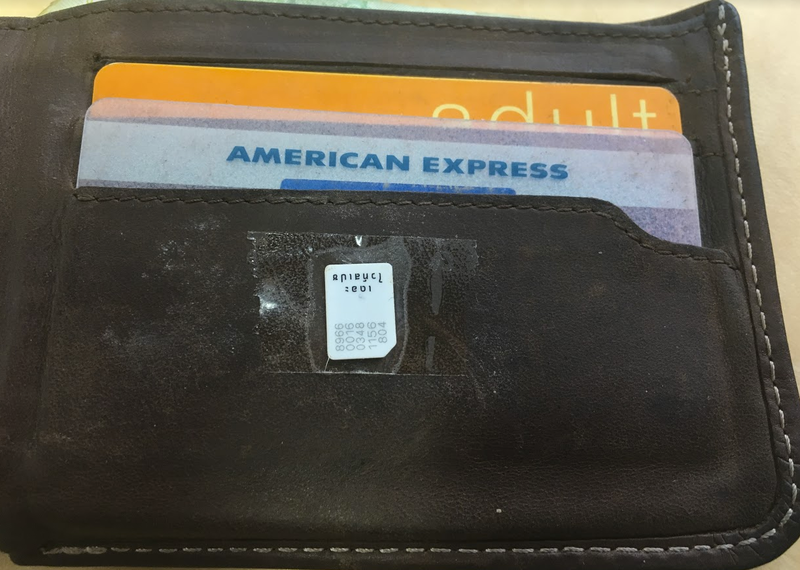 Use tape to stick the SIM to the inside your wallet. NBTC is now enforcing that all SIMs are registered to a user. To do this the staff will take a photo of your passport and upload it to the NBTC servers from inside their smartphone app. All three networks sell Tourist or Traveler SIM cards. The base model is a is unlimited internet for 7 Days and 100 Baht of calling and SMS credit. There are also other flavors like 15 and 30 day packages. You might also see cards with “Unlimited Whatsapp or WeChat” as additional benefits. 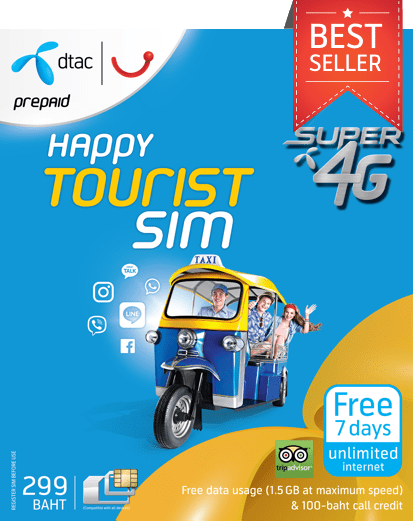 DTAC was the first company to offer the Tourist SIM cards and the prepaid 299 Baht DTAC Tourist SIM is a good choice. It’s tri cut – works in iPhone and it comes with credit already, so you don’t need to load any on right away and it’s designed for tourists with both data and voice packages. The BKK airport has a couple Family Mart‘s in the airport who usually sell SIM cards as well as Top Up Credit codes. Several telecom shops have popped up near the train to the city, so you can also look there. If you’re not able to get a SIM card in the airport, no problem. Every 7-11 in the country carries SIM cards and Top Up Credit. There are over 7,000 7-11 stores in Thailand. You’ll be asked for ID. (That’s one store for every 9,428 people in the country.) Also any mall is going to have phones for sale as wall as official DTAC, AIS and True Move retailers. If you got yourself a Tourist / Traveler SIM, the data working after activation (inserting the SIM into your phone and getting activation SMS). Most likely it will work right away. If not, grab a staff member and hold on to them till they fix it for you. APN settings for AIS, DTAC and True Move. If you finish the 7 day unlimited period, use up your calling credit or finish any data package, you’ll need to add more funds. In Thailand it’s called top up, but other places call it adding minutes, recharge, refill, load or top-up. How much credit you need is up to your use case. If you want to get day by day internet packages, they cost from 20 -80 Baht per day. If you want to make calls, they cost from 1 – 3 Baht/minute for domestic and 3 to 50 Baht for International. An internet package is a way to pre-purchase an amount of data you would expect to use in a month. Unlimited data (at capped speeds) starts around 400 thb for the month, and goes up to about 1000 thb. You can buy daily, monthly, weekly, volume based, time based and add on data packages. Go here to look at the packages and how to subscribe to them. All require you have enough credit on your phone. Monthly packages will auto renew if you have enough credit. If not, the package will cancel, and you’ll manually need to sign up again. A majority of cell towers in Thailand now have 4G at speeds good enough for video calls, . You can check Thailand’s networks here. Currently AIS is the fastest. Here are the call center numbers for AIS, DTAC or True Move. They can help you subscribe a package and tell you where to find a shop where you can go in and get help. They all have an English speaking option. Help others by leaving a note about your experience in the comments below.